Feedback: 77 comments - leave yours! I love to embrace a foreign civilization through its artefacts. Especially food artefacts, those utensils that serve to prepare meals and those edible concoctions durable enough for you to take home. India is rather fascinating in that respect, but in terms of quality and elegant minimalist design, Japan beats every other country I've ever visited. I have dreamt of this one. A oroshigane, the traditional wasabi grater made from wood and shark skin. That's right. Wasabi is not the crap you eat with sushi. That one is an industrial paste made from horseradish and green food coloring. Real wasabi has a mellower taste and its cost reminds you of French truffles. It is a big greenish phallic affair that only keeps for a few days wrapped in a wet towel in the fridge. Serious Japanese restaurants (not only sushi places) sometimes grate it at the table, so you know that it is the real deal. And for this they use a sharkskin grater as fine as sandpaper. Dusting off excess flour from my pasta board with this handbrush will be like an act of art. Such a delicate and simple design. ... or that salad spoon (other side)? I never could stand salad. But now, with this plastic salad leaf bought in a restaurant props shop in Kappabashi-Dori, I can make you guys believe that I'll eat my steak with salad. I bought three mock bento boxes filled with candies. From what I could see, these are mostly bought by obese Japanese schoolgirls. They look more than they taste - this is mainly colored sugar. But eye candy - that it is! Eyecandy with a taste. Sweet and sour, with a funny sumotori head looking at you as you eat them, I bought these candies at the train station in Asakusa, Tokyo. One of the two hand-forged knives I brough back from my memorable visit of Sakai's mighty bladesmiths. Astonishing piece of steel that I will demonstrate with my modest knife skills in an upcoming video. Feel bloated after eating too much sushi? I have what you need, bought in Osaka but imported from the US of A. Doubles as a handy tool to prick meats before marination. A gift for the man who has everything. 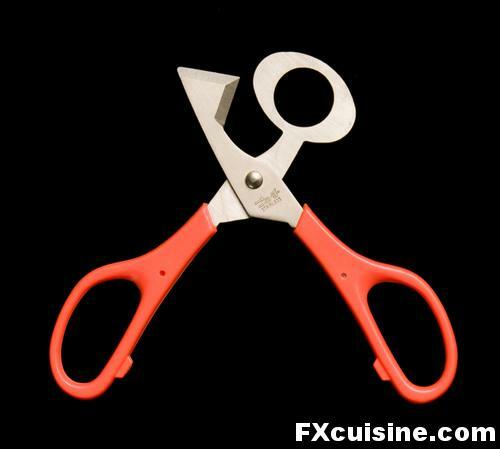 These scissors enable you to cleanly cut the top off quail egg and not make a mess. At last! If you like it I'll take pictures of other items. FX's answer→ Yes I love those bento boxes, too! One reason real wasabi is so danged expensive is because, like truffles, it just doesn't grow many places. Basically, a few Japanese mountainsides and a farm in Oregon. Luckily, while it doesn't keep well fresh, once it's grated it can hold up surprisingly well frozen, a boon for those of us who don't live close to either Oregon or Japan. Also, a few of the wasabi-in-a-tube pastes do contain real wasabi - often cut with horseradish or mustard, but it's still better than the industrial green powder that is usually used in restaurants. FX's answer→ Yes, I recall seeing Japanese farmers in the Japanese Alps sitting in the snow with a blanket open and 5 Wasabis for sell! Didn't know that it could freeze though. FX's answer→ Thanks Nan, indeed there is much to be seen in details, I love textures (in the proper sense), materials, colors in close ups! FYI: the salad spoon is from Korea (Korean is written on it). FX's answer→ Hank you are right, now I recall buying it in Seoul in the food hall downstairs from Coex! 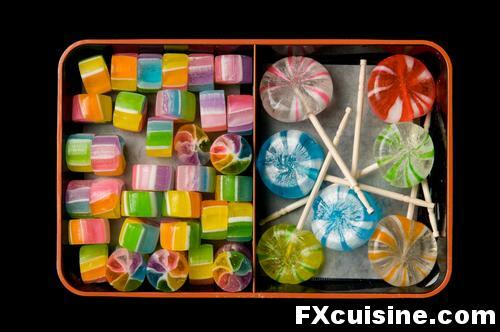 FX's answer→ The eye candy is not really for eating, it's just bland sugar, nothing too good. But so nice! Beautiful photos. Love kitchenalia! Definitely post more if you can! FX's answer→ Thanks Sue, I will organize a new photoshoot then! These are great.. such beauty in everyday objects.. even if they aren't our personal every day objects. Love the pictures.. keep them big! FX's answer→ Thanks, I have no plan to make the pictures smaller! A writing colleague and I look for odd candies whenever we travel. The oddest yet is the French snack, that resembles neon-colored communion wafers, glued together and puffed up in the middle like tiny 1950's space-ships, filled with sweet-n-sour powder. Unless you include the raw dried cod chips, for tasty and historical munchies from Iceland. We didn't eat the wafers, but I refused to share the chips. FX's answer→ Donna I think Japan might land you the wildest snacks ever, all nicely wrapped in a zillion layers of paper. How about bee larvaes? Or fishes in honey, sold in airports? Or perhaps dried baby craps, with the shell - soooo crispy! Love the tools from Japan! I would like to see more. Maybe a few photos of the quail egg scissors in action? FX's answer→ Jessica I need to try and cook some quail eggs and I'll try to demonstrate said scissors some time! I love those little sumotori candies, they look so ferociously angry with us. Does the knife that you picture here have a specific purpose or is it the equivalent to a chef's knife? FX's answer→ The knife is a general purpose vegetable knife, very, but really very sharp. I also have a long sushi knive which I will try to photograph for a little show and tell! Oh please take more pictures, and how I love Japan! 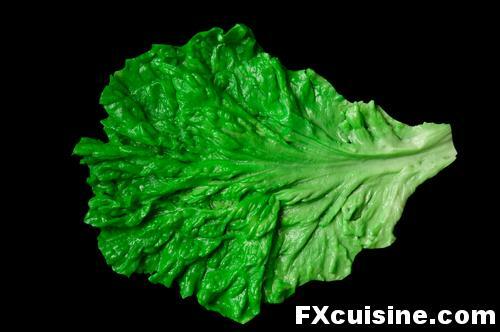 Ehm, one tiny remark: It's a lettuce leaf :). I understand your choice for salad leaf, because in French you probably call it salade, Dutch we call lettuce sla (which sounds almost like salade), but salad is the dish often made with lettuce. I'm so jealous about your trip to Japan. Another thing I would like to mention is that I found angelica stems! They are not sold in The Netherlands, but I found them at the KaDeWe in Berlin! I was so surprised and pleased that I bought the whole lot. :)I'll soon make the angelicapie. I thought it was pherhaps good for you to know, since people could ask you where to find them. articles about visitings etcetera than of recipes. That's fine to me but you make me so happy with your recipes. Are there pherhaps any recipes coming? FX's answer→ OK, more pix are on the way, but first I'll treat you to some more Londonese experiences. oh yes, more please - I think I am drooling more over these than the food pics. FX's answer→ Ah but Japanese cuisine is full of mysteries ... but in this case it was CRABS, pictures of which are to be found in article #51 "May I eat your shrimp shells"! 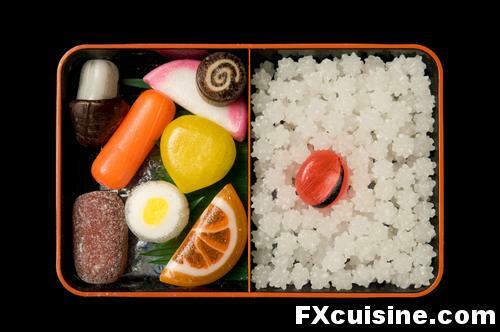 FX's answer→ I have more Japanese confectionery and very intriguing delicacies ready for the camera! The quail egg cutter and the meat poker are particularly eye-catching. Looks like it was a fun time in Japan. FX's answer→ Yes, a visit of Japan is always rather nice! FX's answer→ Ah yes, those jellied pastried served in tea houses, I love them, but they don't preserve long enough for me to take pictures back home! There is a shop in London and one in Paris that offers them though. I love all that surreal Japanese faux food (or food impersonating other food). But I especially like the quail egg scissors--so very useful, as the shells on quail eggs are very tough and nearly impossible to break without damaging the insides. I think I need a pair (you know, for the once every year or two that I actually use quail eggs). FX's answer→ I think I used them a couple times for my quail egg curry (see article of the same name) but can't remember when was last. Time to try again! like very much. more would be great! FX's answer→ You can count on me! Please take more photos of the other items!. FX's answer→ OK, I will! 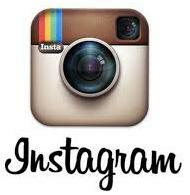 A fantastic new page, a great addition to the best food and cooking website on the net. I would love to see more from Japan but look forwars to seeing more from everywhere as well. FX's answer→ Thanks Gareth, indeed baby crabs are delicious, especially when fresh. Who would have guessed that the shell is where the taste lies! I second the request for a demonstration of the quail egg cutter! I have wondered what to do with them, they look so cute in the store. FX's answer→ Teresa, what sort of dish should I cook with the quail egg cutter? Francois,Promise all of us that you will not practice with the scissors first-you know,just in case the dialog on the video gets boring,before the quail bit. FX's answer→ I'll do my best! Oh by all means, more photos! This is so very interesting. FX's answer→ I'll work on more photos then! 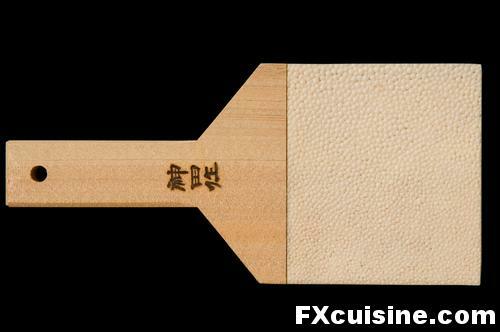 I enjoy your website a lot, but, small correction: the bamboo spatula appears to be of korean manufacture, as its brand name is written in korean. However, I guess I don't have sufficient evidence to say so definitively, for the spatula may have been produced for exclusive sale in korea (and hence, branding the item in korean). otherwise, keep up the great work! 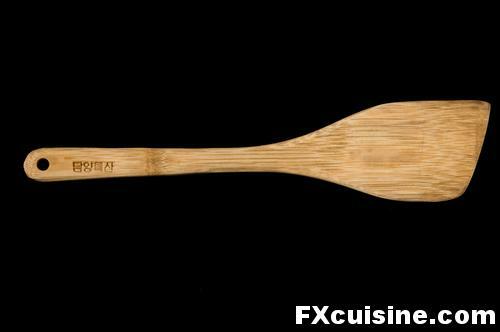 FX's answer→ Yes Jenny, this spoon I bought in Korea. It must have been very hard to restrain yourself while shopping. The Japanese are obsessed about perfection. Handcrafters are considered artisans. I have never used any knife that was better than my Japanese one. I, too, purchased fake food. It was 5 pieces of sushi on a lovely plate. Oh, how I long to go shopping again in Tokyo. FX's answer→ Yes, difficult indeed, but the Yen helped me restrain myself! FX's answer→ I'll start working on them right away! yeah yeah yeah i want more bring it on !!! P u r e b e a u t y ! FX's answer→ Thank you ! The meat tool reminds me of the tool I have to break up slab chocolate. Another use for it, perhaps. Looks like you picked up a Korean artefact as well, Francois! (That wooden salad spoon.) And I love those samurai head candies! I've never seen those before. 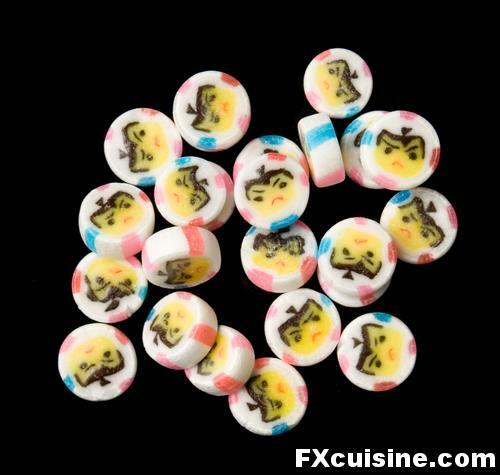 Also those rock candies are an East Asian staple food for kids! Honestly! haha. I still eat those at tea ceremonies! FX's answer→ Yes, aren't they cool-looking! hey...love the pics, especially the knife!! i wonder if it was costly...i would love to get my hands on one!! FX's answer→ Yes, read the article about Japanese Knives which I published just before that one and you'll learn all about it. Awesome Pictures Dude, i was in Japan last year as well and in loved it !! FX's answer→ Thanks and glad you liked it! These are some great items. Many I've never seen before in my life. 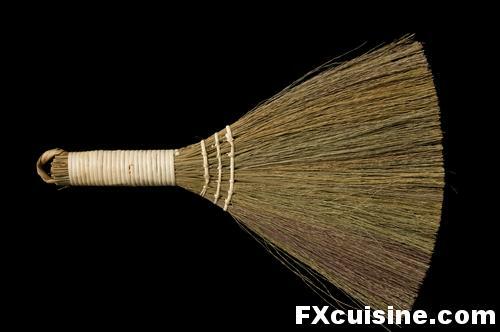 It's amazing what other countries use on a day to day basis that many do not even know exist. Hey, nice website and nice pictures. I would like to know where can I buy the quail shell scissors, I need them to make quail eggs kebab. I know what I'm looking for when I travel over to Japan. These are some neat items. Thanks for sharing them. Estoy fascinada con tu página, con la información y con tu elegancia. Just love it!! So fun, I'm in Kyoto right now and see a lot of the same things! I'm planning on making a trip to Osaka soon, do you have any tips on knife buying? 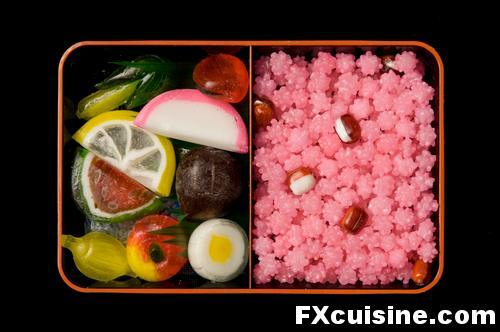 Love the mock bento boxes filled with candies! Fantastic photos!! Makes me very angry i didn't pick up more when i was last in japan. By the way did you know that the bloat relieving meat pricker is an ice pick? Fun pictures. It makes me nostalgic from my time in Japan. FYI--the spoon is actually a rice paddle. There is usually a small container for water, and the paddle is kept wet. That way, the rice doesn't stick to the paddle when you serve it. FX's answer→ Lisa thanks for the explanation, most of the time in Tokyo I did not dare ask what it was for and just assumed a cheffy look! One reason genuine wasabi is so danged costly is on the grounds that, similar to truffles, it simply doesn't develop numerous spots. Fundamentally, a couple Japanese mountainsides and a homestead in Oregon.Fortunately, while it doesn't keep well new, once it's ground it can hold up shockingly well solidified, a help for those of us who don't live near either Oregon or Japan. Wonderful photos. Brings out the innate genius in the design of each item. By the way, if you ever go back to Japan and don't want to spend a fortune on cooking items, you can always shop at Daiso. It is a chain store that sells most of the items for 100 yen. There are a few other chains like it, such as Seria. Not the most elegant shopping experience, but you can find all sorts of well designed, daily use kitchen ware. Last time I was showing a visiting friend around Kyoto, she said she really, really wanted a sesame grater. We looked high and low and finally found it in a humble Daiso. FX's answer→ Thanks Jean Pierre, I will definitely Check out Daiso where the yen is bigger!